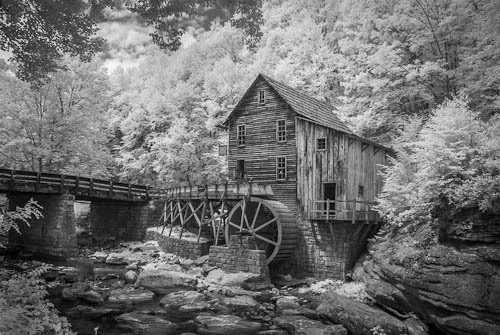 I’ve sometimes said that if I saw another photograph of the Glade Creek grist mill in Babcock State Park I would scream. I keep seeing them but thus far I have restrained myself. I visited the park a couple of years ago and made some photographs, none of which excited me. When I was down in that area last Monday, my route took me right by the main entrance, so I thought I would take another look. 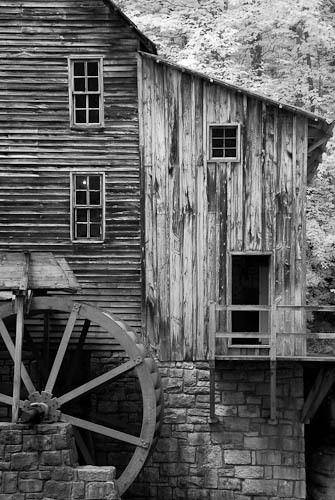 Naturally, when I got to the mill, I had to take some shots. With a subject like this, I feel I must at least come up with a different treatment from what has become a cliche shot. I happened to have my Nikon D200 converted for infrared with me so that was the camera of choice. A while back I posted a discussion of IR photography here. ~ by Admin2 on July 26, 2012. Great patterns in these images. Thanks for sharing. Great texture! I love IR and this shows it off well!